As I stood atop Peters Mountain along the Appalachian Trail taking in views of the Susquehanna River, I felt more alive than I had in a long time. I may say that I work for my beer and have grand visions of weekends spent exploring the great outdoors with a stop at a local brewery after to hoist pints and compare stories of adventure. But, if I’m being honest, most weekends are spent tossing bags with one hand and downing a well-loved IPA or three from my neighborhood brewery with the other. Which was what led me to spend the morning hiking a section of the Appalachian Trail: to experience something new, adventurous, and, most importantly, authentic, with the journey eventually culminating at Tröegs Independent Brewing–a brewery I’ve long admired for the rebellious nature with which they brew cult classics like Mad Elf, Troegenator, and Nimble Giant. If beers this audacious are readily available throughout their distribution footprint, I couldn’t wait to try offerings held closer to home like the sour and wood-aged beers from the brewery’s Splinter Series. But Tröegs would have to wait. First, there was plenty to explore in Hershey. I worked up quite an appetite from my hike, so I headed to the Broad Street Market in nearby downtown Harrisburg. The sheer volume of vendors hawking everything from fresh produce and grass-fed beef to prepared foods is unlike any market I’ve experienced in much larger cities, but I have to remind myself that Hershey and Harrisburg are unlike any place I’ve been before. Locals pride themselves in the entrepreneurial spirit that has lived for generations on family farms and within Mennonite and Amish communities. 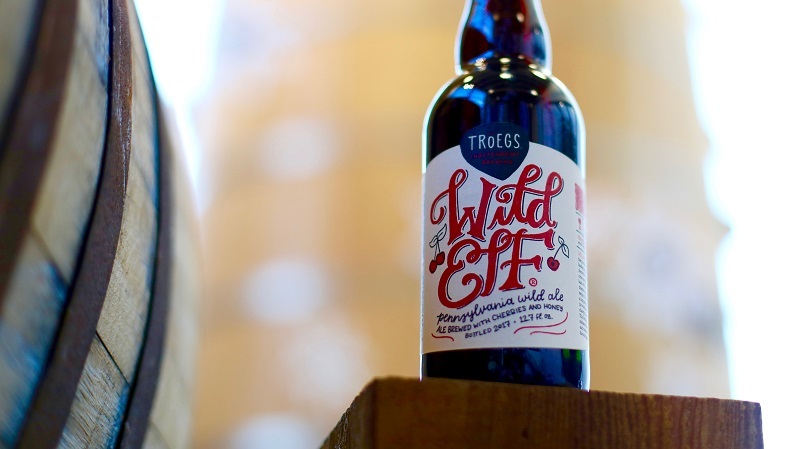 This same spirit influenced John and Chris Trogner to open Tröegs in 1997. I ordered an ice cream cone–717 Cherry made with antibiotic free dairy from a local farm and churned in small batches–from Urban Churn and began to peruse the food stalls for lunch. The variety spanned everything from Puerto Rican to Korean and Pennsylvania Dutch. I couldn’t decide, so I ordered an international buffet for one–West African okra soup from Tasty Dishes, bacon-fried cabbage pierogies from Pikowski’s Pierogi Place, and Jamaican oxtail from Porter House–and watched as families enjoyed lunch together and business men popped in for a boxed lunch to bring back to their desks. A few blocks down the road from the Broad Street Market is the Pennsylvania State Capitol. I’m not typically one to tour state capitol buildings, but enough locals urged me to give it a shot. “It’s the most beautiful in the country,” said the passenger next to me on the plane. She was right. 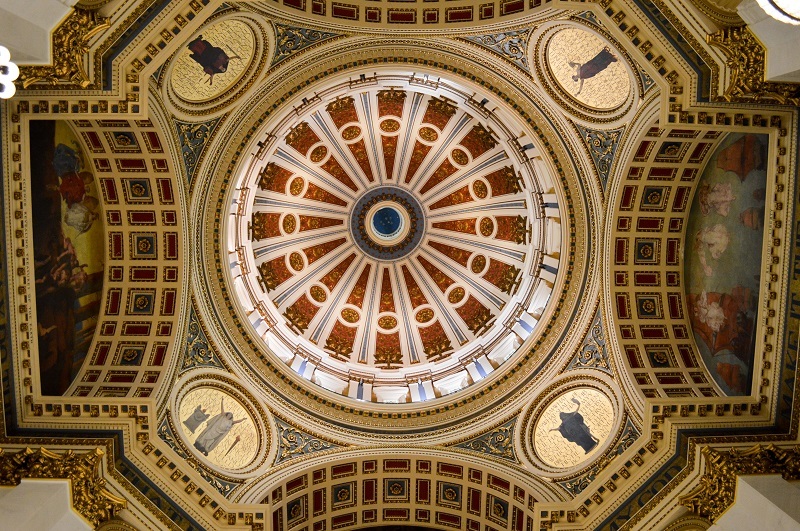 From the rotunda inspired by Michelangelo’s St. Peter’s Basilica to the ornately decorated Senate, Congress, and Supreme Court chambers, the building is truly the palace of art that architect Joseph Huston intended, with lifesize murals depicting Pennsylvania history and messages of just governance flanking the walls. I next turned my direction from the area’s past to its future at Millworks, located adjacent to the Broad Street Market. Among the rafters and creaky floors of the old mill’s second floor are a patchwork of working artist studios, where artists like weaver Jenna Carls, potter Erin Dean, and filmmaker/photographer Caleb Smith make their living. Back downstairs in Millworks’ restaurant, I feasted on a dinner of creative ways to infuse local ingredients into modern dishes–a starter of macaroni and cheese made with local cheeses from the Lykens Valley Creamery and a main of wood-grilled trout with seasonal vegetables and a chimichurri vinaigrette–all washed down with local brews. My night is almost complete. Almost. I wrapped up the evening across the river at Grotto Pub, a hearty Midwestern dive bar where I’m greeted by friendly locals and my first taste of Tröegs on draft. My plan to kayak Swatara Creek was thwarted by thunderstorms. A warm cup of coffee in front of the fireplace at Cocoa Beanery and a conversation with the barista sent me museum hopping instead, starting with the National Civil War Museum. I spent a few hours contemplating the battlefields and stories of our country’s darkest days. The experience is narrated by 10 voices. Each tells a unique story from the war–a freed slave, a southern farmer, three brothers torn by the conflict, etc. I’m still chilled by the voice of the eldest brother, a soldier for the Union army, narrating a letter to his wife about how disappointed his father would be to know one of his sons cowardly fled to the West and the other was fighting in the rebellion against the federal union. 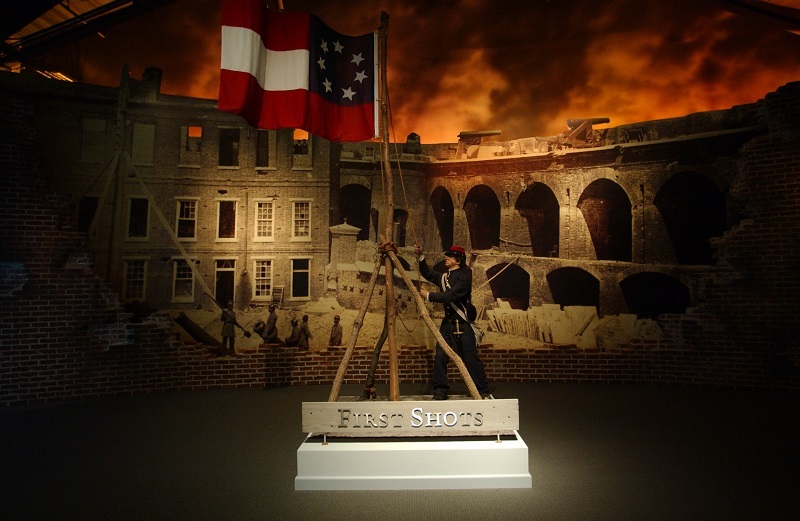 The displays covered more than the strategies and battles that decided our country’s fate and the why’s from both the Confederate and Union sides; they were about people, tragedy, rebuilding, and healing. 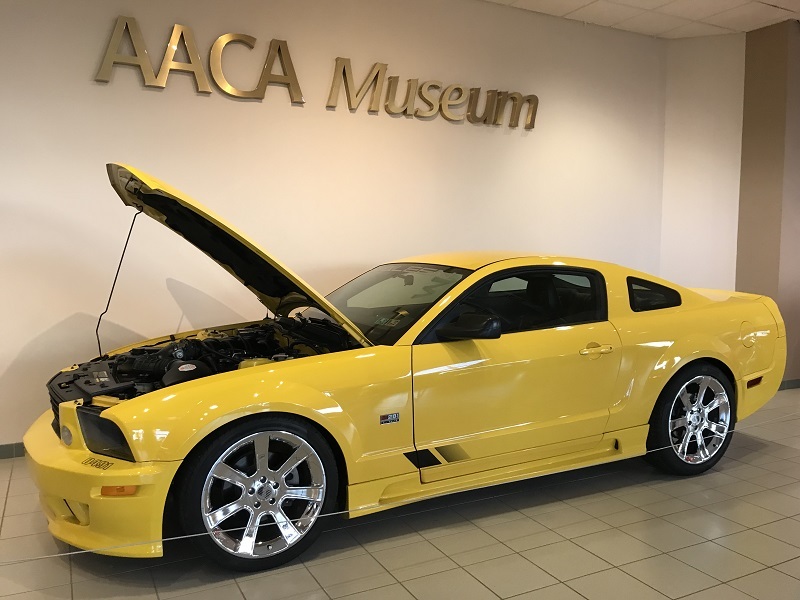 As awe-inspiring as the National Civil War Museum was, I needed something to lift my spirits back up and headed over to the AACA Museum in Hershey for a walk down another history lane. This one is filled with big-block engines, mag wheels, and the bus from the movie Speed. Yes, the kid in me came to life as I stared upon a 1966 Shelby GT350, like the one my dad used to own. I began to relive my own fast and furious days of souped-up Mustangs and a need for speed–you know, the days before minivans and soccer practice. Jacked up on adolescent adrenaline, I pointed my rented Kia Soul toward Tröegs–the reason for my trip to Hershey. I was greeted at Tröegs Independent Brewing with a break in the clouds. The patio and beer garden were filling up with craft beer faithful looking to soak up some rays. Already, I was thinking of joining them with a citrusy and piney Perpetual Imperial Pale Ale (the ultimate pairing for the now steamy weather), but my attention was diverted towards three towering foeders highlighted by floor to ceiling windows in the front corner of the building. I wanted to not only know what’s aging away, but to also try what they’re producing. As I stared up at the signs identifying what each foeder housed–a Wild Elf brewed in September 2016, another from July 2017, and a soured Belgian dubbel called Splinter Bronze–I felt a little tingle down my spine thinking about what’s happening inside those 21-foot-tall oak monoliths. My daydream was interrupted by one of the tour guides, Christie, who offered a tour. 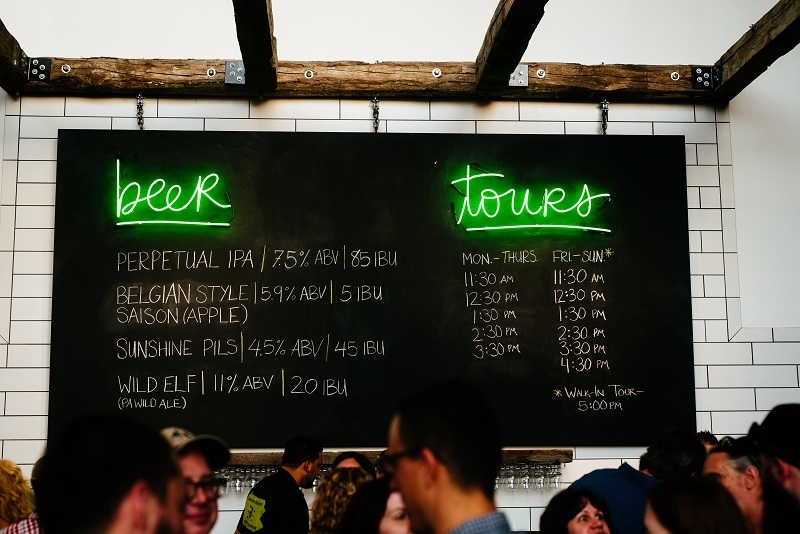 While I’m not one to go on brewery tours–once you’ve seen one, you get the premise–Christie reminded me that Tröegs’ brewery tour is one of the most highly rated in the country. Plus, it starts with a welcome beer. On this particular day, that beer was a pour of the aforementioned Wild Elf, a wild cherry ale aged to perfection on oak. Sold. Beer in hand, we headed up to the Art of Tröegs Gallery, where Christie gave a summary of the brewery’s history. We were given a few moments to peruse the gallery, where fan favorites and winners from the brewery’s annual Art of Tröegs contest are displayed. An eclectic mix of art dot the walls, like a whimsical “Renaissance” style portrait of co-founders Chris and John Trogner, a pair of Nike Dunks with a tailored upper made out of Tröegs’ beer labels, and a 3-liter bottle that’s cut to look like it’s being zipped open. The tour continued into the brewhouse with a bit more on the brewing process than most include. Just when the talk was about to get, well, boring, Christie delivered a humorous aside about the first time the Trogners brewed Mad Elf. John arrived at the brewery on a Saturday morning to lead a tour, only to find the entire place soaked in cherry juice. The beer was rather innovative for its time, and the brothers failed to account for how rapidly the juice would ferment. Stories like this raise my respect for Tröegs. They don’t brew normal beers, but instead push the boundaries and are rewarded for their efforts with a rabid fan base. Another highlight of the tour was the green beer sample. I beer geeked out over a pour of the First Cut Mango IPA. The hops were grassier and more abrasive than the final packaged product where the Comet and Simcoe hops complement the exotic mango notes with a bitter citrus pop. After the tour, I perused the beer menu above the bar in the taproom. I wanted to order what I came here to try–Troegenator from the source. But, I also felt compelled to try something different, something I haven’t tried before. I chose a beer from Tröegs’ Scratch Beer Series–where the brew team experiments with new ideas, recipes and brewing processes. 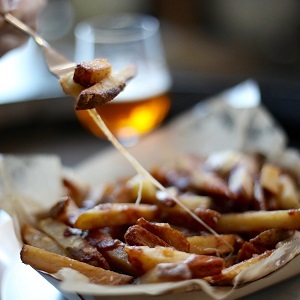 I opted for the Perpetual Darkness–a dirty blond barleywine meets double IPA–and paired the refined toffee and sticky citrus notes with a starter of poutine fries with bone gravy and cheese curds and a main of duck confit with fried gnocchi. As I sopped up the remaining bone gravy with my last fry, I contemplated another round. I wanted to see how else Tröegs pushes the brewing envelope and ordered a bottle of Dear Peter from the brewery’s Splinter Series. The tantalizing sour is brewed with nectarines from a nearby farm bruised during a hailstorm and aged on oak. As Tröegs proves, what’s too ugly for a roadside farmstand still works perfect for beer. The beer itself was deceiving. The aroma delivered a bouquet of ripe, juicy nectarines with hints of oaky vanilla and a slight funk. On the tongue, the beer presented a nuanced battle of funk and ripe fruit that seemed to sum up my trip to Hershey and Tröegs. 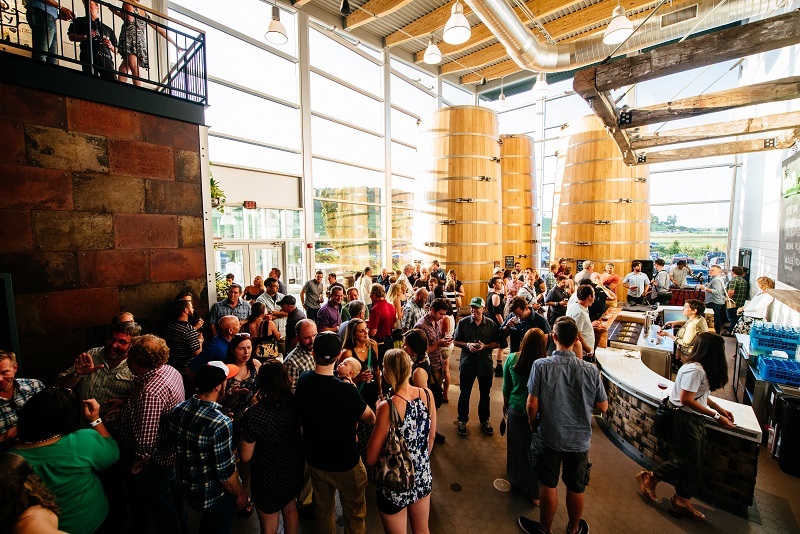 Tröegs isn’t your typical brewery experience. Like so many other establishments in Hershey, it’s authentic and shaped by makers who truly care for their craft.